If you’re looking for fun things to do in Jacksonville, Florida, Big Canoe Fun has fun outdoor activities for families and groups looking for an adventure on the First Coast. 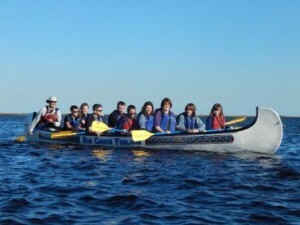 Big Canoe Fun offers guided War Canoe tours for groups of up to 18-paddlers in big, 25’ Voyageur-style War Canoes. Big Canoe Fun offers the only guided War Canoe tours in Jacksonville – allowing families and groups to experience a truly unique outdoor activity that is sure to create lasting memories. One of the fun things to do in Jacksonville is the Canoe-to-the-Zoo trip with a group in War Canoes. Big Canoe Fun’s professional guides will meet your group for some pre-trip instruction before climbing on-board for a short paddle down the Trout River to the Jacksonville Zoo and Gardens. Once at the zoo, guests are invited to explore the Jacksonville Zoo and Gardens and its exhibits and spend a couple hours enjoying the sights and the more exotic zoo residents. Guests can also share a picnic lunch while enjoying the day together at the zoo. When the safari’s over, everyone gets back in the Big Canoes for another leisurely paddle back to the put-in. Departing from the Saw Pit Creek boat ramp on Big Talbot Island, Big Canoe Fun’s 10-person War Canoes head out into the Nassau Sound and along the coast to scenic Black Rock and Bone Yard Beaches. Once at the beach, guests will have plenty of time for a snack and some beach-combing surrounded by some of the area’s most stunning coastal landscape. Guests should be sure to bring a camera to take advantage of the abundant photo-ops and possibly capture a Bald Eagle or an Osprey hunting for lunch. Canoeing or kayaking at Big Talbot Island should be near the top of any list of fun things to do in Jacksonville. Visiting Kingsley Plantation is always an interesting and educational experience, but when you visit Kingsley Plantation in a 25’ Voyageur-style War Canoe, interesting becomes, “exciting,” and educational becomes, “FUN!” Launching from Alamacani Boat Ramp near the mouth of the Fort George Inlet, guests will experience a little of everything the First Coast has to offer – white sand beaches and bars, salt marsh estuaries, striking natural beauty and historic scenery. Exploring Kingsley Plantation gives visitors a glimpse into the past as they get an up-close look at what life might have been like on a 19th century Florida plantation. Guests are welcome to bring a picnic to enjoy on the grounds before paddling back to Alamacani. For a truly unique adventure, urban paddling in a big canoe is your ticket to fun in the River City. Surrounded by towering skyscrapers and Jacksonville’s iconic bridges, canoeing in Downtown Jacksonville allows visitors to blend the old with the new as they travel an ancient waterway in much the same way people have travelled this river for thousands of years. The Jacksonville Landing, St. Johns River Marina, the Hyatt-Regency Jacksonville Waterfront, Friendship Fountain and Metropolitan Park are just a few of the sights along the banks of the St. Johns River. On Saturday mornings, the Riverside Arts Market (R.A.M.) is another of the many fun things to do in Jacksonville; and, getting there is even more fun in a War Canoe with a group of friends and family. There are just too many fun things to do in Jacksonville for anyone to do them all; but by combining fun outdoor activities and interesting places and attractions you can make the most of your day-off, weekend or vacation. Paddling a 25’ War Canoe is definitely one of the most fun things to do in Jacksonville; and visiting the Jacksonville Zoo and Gardens, Kingsley Plantation or one of the many other interesting and exciting attractions on the First Coast will surely add to an already great time. And, if you’d like to give kayaking a try, Up The Creek Xpeditions provides the most professional guided kayak tours and eco-tours on Florida’s First Coast and offers trips to each of the destinations listed above. For more information about canoeing and kayaking in Jacksonville, or to book your on-water adventure, just visit: www.BigCanoeFun.com or www.JacksonvilleKayakCompany.com.